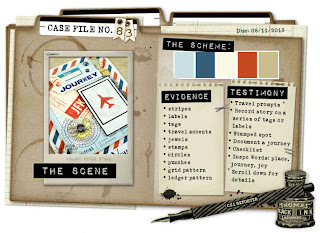 This month over at CSI the theme is travel, so lots of opportunities to scrap some holiday photos - even some which may have been hanging around in a box for years! I decided to scrap a picture of my boys on holiday in Benidorm with their Dad back in the early 90's. Some of the bits and bobs on the page are real souvenirs (the menu, luggage tags, cards) and luckily happened to be in all the right colours! One of the many reasons I love scrapping is that it's a great way to keep all the stuff you collect, as well as the photos, and it really helps to tell the story. The Evidence: (I included every item on the list!) stripes; labels; tags; travel accents; jewels; stamps; circles; punches; grid pattern; ledger pattern. 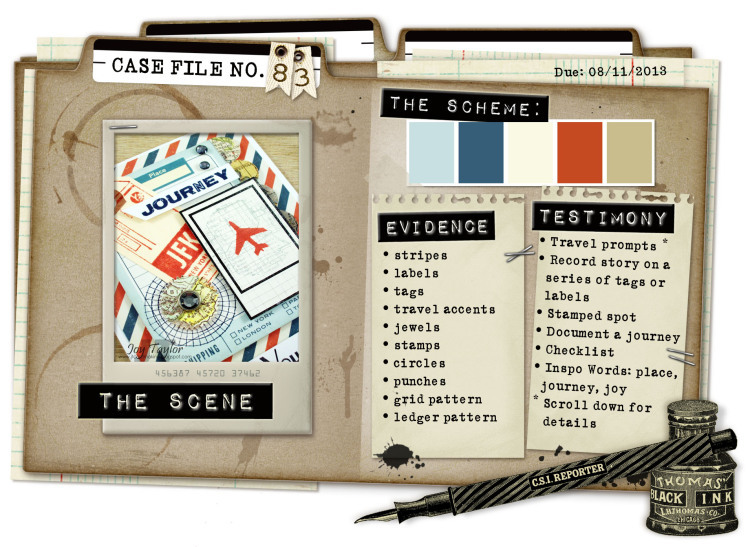 The Testimony: the details of their journey are documented over a series of labels and tags. There is also space for a personal letter inside the little envelope. Here are some details under the magnifying glass, so you can check that I have followed all the clues properly! Thanks for looking at my page - make sure you check out the gallery over at CSI to see how everyone else has solved this case.